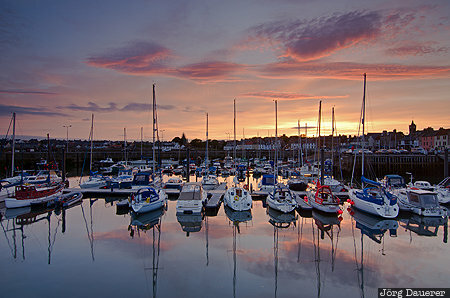 A colorful sunset and its reflexions behind the boats in the harbor of Anstruther. Anstruther is in Fife in the south east of Scotland in the north of the United Kingdom. This photo was taken in the evening of a sunny day in July of 2013. This photo was the image of the month in December of 2018. This photo is in the Photo Calendar "Scotland". This photo was taken with a digital camera.